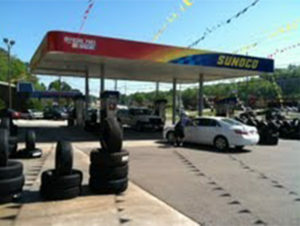 Vestavia Tire Express is a trusted Birmingham business that has been family owned since 1976. Bob and his team offer you a full service gas station experience when you visit our location on Highway 31. and we are the official towing services for the city of Vestavia Hills, Alabama. 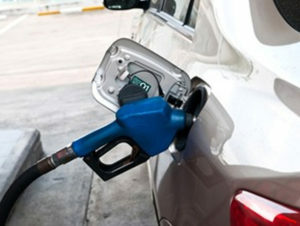 We offer a variety of services to get your car filled up and in check. Visit us for a Sunoco gas fill-up, express oil change, and complete auto repair services for brakes, air conditioning, suspension, and wheel alignment. We have some of the lowest prices in town on new name brand tires! Whether you need them because your tread is low or you have a flat, you can always count on Vestavia Tire Express for reliable and knowledgable service. Learn what to do when you have a flat tire here. We understand you’re on the go. 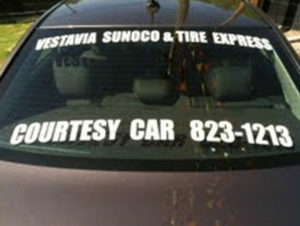 If you can’t wait for your vehicle, we offer courtesy cars so you can get back to life while we safely fix your car.